When one considers the many obstacles people have to deal with throughout their lives one can marvel that they still keep going. Destitute people, institutionalized people, those in war situations and those with physical, mental or emotional impairments, face hardships and constant difficulties their whole lives or for long periods of time. Many of us have had to face situations that have challenged us to the core. We all have had to grapple with obstacles of various kinds that have stood in the way of our progress, some that may have seemed insurmountable at the time. The will to survive is so great that despite all the hardships and challenges, most people find a way to cope and keep the light burning. Some of these hardships of course are caused by external factors, many of them arise from internal issues. They are all however processed by an awareness that experiences the blocks from within. 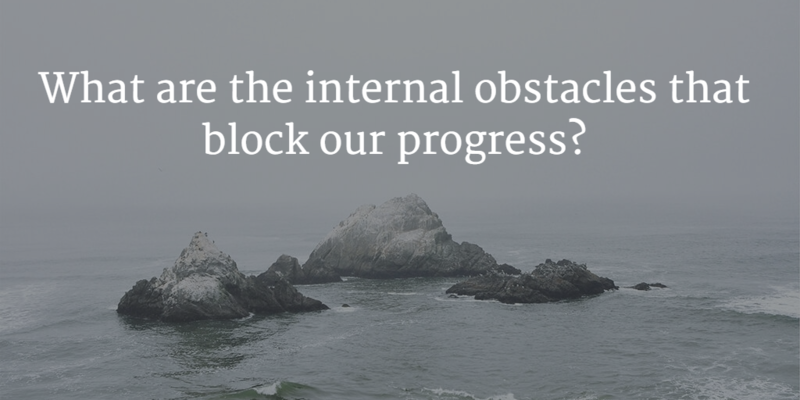 It is about these internal obstacles and especially those that are self-imposed that we want to focus on in this blog. What we are looking at here are not these given circumstances that exist out there, like haemophilia or pollution that have theie specific impact on our lives. It is our own particular human response to these circumstances that we wish to understand, because in the final analysis it is our human awareness that will determine how we deal with our life situation. From early on in life a person’s temperament will influence the way he respond to situations. Hippocrates describes four main temperaments which he connected with four humours that govern the four elements, earth, water, air and fire. The melancholic temperament is weighed down by the heaviness and compactness of earthly substance; the phlegmatic temperament flows in the ease and comfort of the watery element; the sanguine temperament floats in the lightness and volatility of the air; the choleric temperament is activated by the heat and power of warmth. Later in life, the personality or character will become the most critical factor in the way a person lives her life and the source of most of the blocks that will stand in the way of unfolding her true potential. This personality is the unconscious creation of the individual, whose unique inner disposition meets the impressions of the outer world, coloured by the inherited constitution and temperament. It is important to understand how the personality arises. It is not present at birth nor is it present in the young child. It is formed gradually as the child develops and begins to think for herself. As she experiences herself and participates in her immediate environment, she starts to recognize certain patterns in the multiple partnerships she forms and adjust her behavior, her thinking , her belief systems and her feelings in accordance with what she instinctively knows is best for her. Her inner partners interact with her in a specific way and she responds in the way that serves her best interests. The partnership patterns becomes repetitive and begin to imprint as habitual patterns on her awareness ie on her mind-soul psychological organization. With time this becomes entrained into the memory body, which is the vibratory resonance matrix of the life organisation. She creates by repetitive practice that persona who works best for her own interests, who meets her own needs and creates for herself the optimum safety, security, pleasure and gratification. We create our personality, consciously or unconsciously, through participation with internal and external partners. This process happens gradually over time through repetitive awareness – experience and inner practice. The goal is to avoid discomfort and insecurity and to acquire the maximum safety and comfort. There is one other insight of vital importance that usually only becomes obvious when we step into the personality itself, through the participatory awareness process. We realise that this personality is not just one person or one character, but a cast of many characters that act out our subjective experiences in many different ways. These personality formations, these characters can often become huge blocks in our life journey. They arise out of our choices and actions as the work of an intuitive creative genius who was able to find a solution to our deep pain and anguish. We did so as small children when we had no one to guide or counsel us and we continued to do it through our resilience and will to survive, even when as adults, it comes at a very high cost to our wellbeing. In the next blog we will explore further some of the most powerful blocks we may encounter in our modern world.